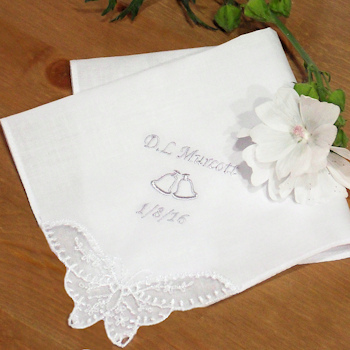 Wedding Bells embroidered ladies white cotton handkerchief with lace butterfly corner. Wedding Bells embroidered ladies white cotton handkerchief with lace butterfly corner. The handkerchief can be embroidered with a title, single name or names and a date of your choice. You can choose to have this handkerchief personalised with initials, a name or a brief little message in a font style of your selection.